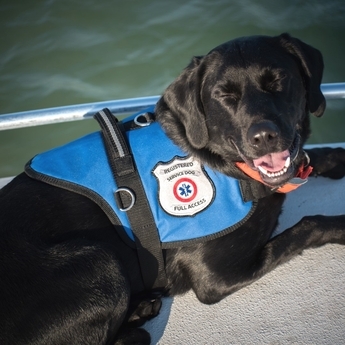 A service dog vest is an important piece of equipment as it identifies to others that your dog is a service animal providing a service to you, not a pet. 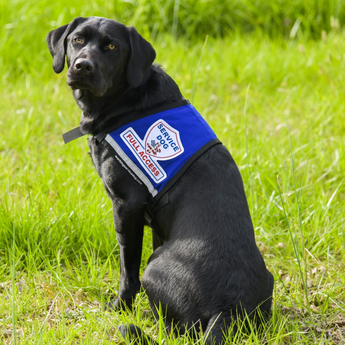 When your service dog wears his vest it is quickly recognizable that your dog has a right to accompany you wherever you go. 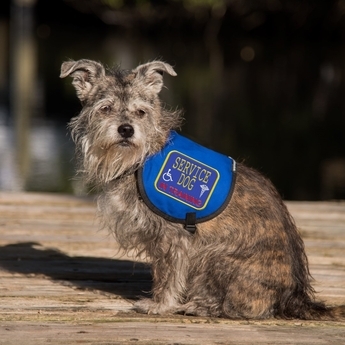 Choosing the proper service dog vest for your dog is an important decision. You should consider, temperature, duration of wear, visibility, handles, pockets and padding. It should be comfortable for your dog to wear while he is working. Although not a requirement, these products are intended to help identify your animal as a service dog. We have created this page to help you choose between the many styles that are available. Ready to wear as soon as it arrives in the mail. Complete packages includes an ID Badge and exclusive patch which is professionaly sewn on for you. Need to carry a few items with you? Then a pocketed service dog vest is the answer. 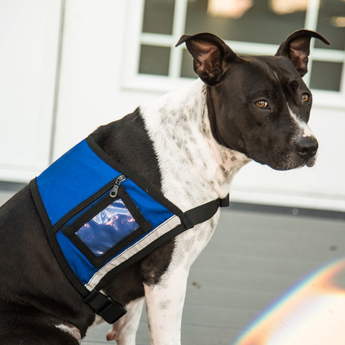 Light Weight Service Dog Vests for all breed dogs. Mesh sides and built in D-Rings makes this vest the perfect vest for all year use. 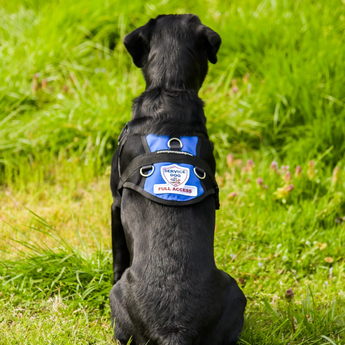 A Service Dog In Training cape vest is a light weight identifying cape to get your new service dog used to wearing service dog equipment. 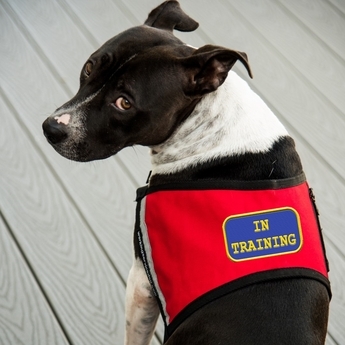 This vest is offered with many "In Training" Patches to choose from. 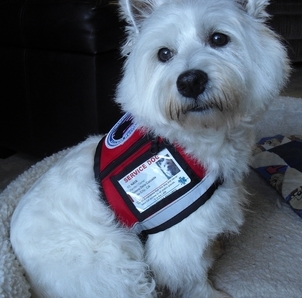 Padded Harness Vests provide extra comfort for your service dog. 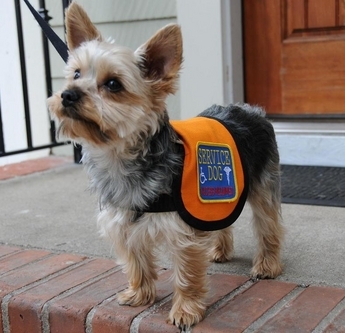 Small Service Dog Vests are typically light weight, and non-restrictive. Some have D-rings for attaching a leash, others are cape style and only used for identification purposes. 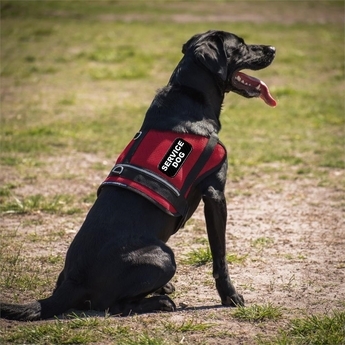 This is a new style service dog vest, great for those handlers who wish to display their service dog's credentials on the vest. Built in ID badge holder, zipper pocket as well as a reflective stripe on both sides of the vest. 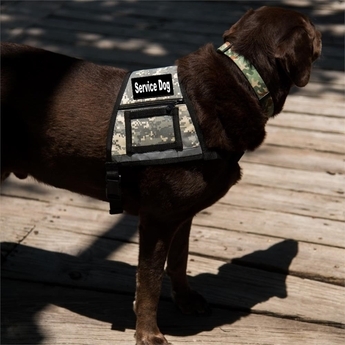 Camouflage Service Dog Vests show your patriotic pride. We offer this vest for dogs XXS - XL with 36 patches to choose from. This vest includes a built in zipper pocket and ID Card holder for sizes small and up. Service Dog In Training Cape Vests are the perfect choice for the small service dog that is still learning to wear a vest. There are no zippers, chest buckles, D-Rings or leash attachments to distract your dog. This cape is also perfect for the small dog that will be traveling on a plane because it is lightweight and soft.